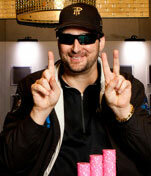 The recent Bicycle Club $10,000 buy-in Championship event in Los Angeles on the World Poker Tour (WPT) began at 2 p.m. I, of course, arrived at 4:30 pm. Whereas most of the World Series of Poker (WSOP) tournaments that I played in this year featured absolutely no one that I knew at my starting table, in this cozy event — there were still 450 players — I had great players Erik Seidel and David Chiu at my starting table. Because of the relatively low number of entrants in this tournament — compared to 2,000 in most WSOP events — the field seemed like it was filled with top professional poker players. I was off to a fast start when I raised it up with J-J, my lone opponent had 7-7, and the flop came down J-9-7. In poker parlance, I had flopped set-over-set. Of course, my opponent lost all of his remaining $13,000 in chips to me in this hand, and my chip stack crossed the $30,000 mark — we started out with $20,000 in chips. It wasn’t like I played the hand great or did anything special, in fact there was not a lot of skill in this scenario, but I’ll take a lucky hand like this one anytime! This hand called to mind the fact that the last tournament hand that I had played in Los Angeles — in February at another WPT event — I went broke when I had the other side of the set-over-set scenario (my 3-3 versus his 6-6 on a J-6-3 flop). After having one of the best seven weeks of poker of my life at the recent WSOP, I felt like I might win this WPT tournament. First place was over $1.5 million, and it would be my first WPT victory, if I could pull it off. Nearing the end of day one, I found myself in total control of the table, with over $45,000 in chips when the following hand came up vs. Seidel. It must be said that Seidel is one of the best Hold ’em players in the world, and has been since he finished second to Johnny Chan in the 1988 WSOP (which was a memorable scene in the movie “Rounders”). Seidel had already hurt me one big pot, when his 5-3 beat my 10-10 with a 6-4-2 flop in an unraised pot. With the blinds at $200-$400, and only 35 minutes to go before the end of day one, Seidel raised it up in late position to $1,400 to go with Qc-Jc. I was in the big blind with 5-3, and thought that it would be pretty poetic to beat Seidel out of a big pot with the very same hand he had crushed me with earlier. So I called the raise. Another reason I called was the fact that I felt like Seidel was relatively weak, which he was with Q-J. Still, if I felt weakness, then I should have reraised before the flop and forced him to fold that Q-J. After a flop of Jd-3d-2s, I checked, Seidel bet $1,600, and I called. After the queen of hearts hit the board, I checked, Seidel bet $4,500, and I called. This was a mistake. I should have studied Seidel, and figured out how strong he was — with his top two pair — and then folded my hand. Instead, I called way too quickly. The last card was the 5c, making me two pair, and I checked quickly. If Seidel was bluffing, or if he had A-Q, I didn’t want to show strength by letting him know that the 5c was a great card for me. Sometimes we study awhile when we hit our card. Now Seidel bet out his last $13,000, and I decided that I had to call. After all, I could be any over pair like Q-Q, K-K, or A-A; I could beat K-Q or A-Q; and I could beat all of his bluffing hands as well. I called, and Seidel showed me top two pair vs. my lower two pair. Ouch! Not only did I lose a big pot, but I lost it in a hand that I never should have played in the first place. Was I unlucky that I hit the five on the end to trap me into calling Seidel’s last $13,000 bet? Yes, but I should have never called the initial $1,000 raise in the first place. I mean: “Poetic to beat Seidel right back with the 5-3?” What the heck does that have to do with real world poker? Not too mention that I should have folded the hand on fourth street for the $4,500 bet. So I cannot complain about this hand and being unlucky as I did it to myself. That wound was self-inflicted!